To change devices settings, login to the MSPControl and click on Devices Settings or go to Organization > Organizations > Devices Settings. You will see the list of settings. Let's take a closer look at them. Note: Please only change device settings if you are advanced user or system admin. First, you can choose whether you want to enable Auto Update, Exchange MAPI Integration, or Cloud Folders Integration, and specify maximum size of upload. 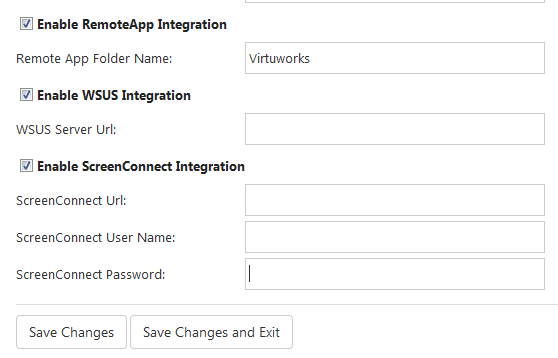 Next, you can enable or disable RemoteApp Integration, WSUS Integration, and ScreenConnect Integration. When you're done here, click either Save Changes or Save Changes and Exit. The former will leave you at this page, the latter will redirect you to the main page of MSPControl.